It was a great trip. It's a good thing that there was no mileage fee for the rental car! 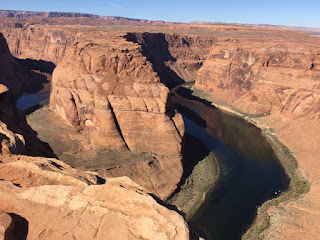 Out of 6 days, we spent 4 very full days travelling and seeing the sights. 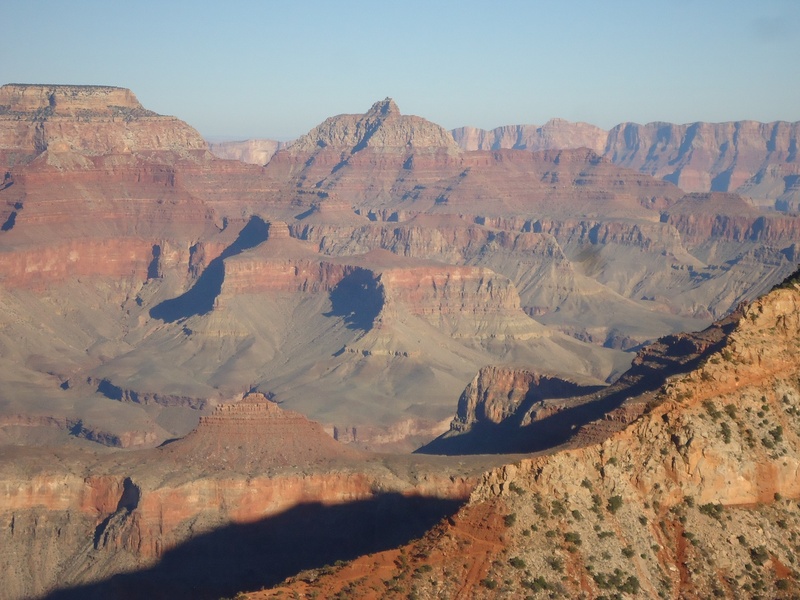 We went to four National Parks and one National Preserve in four states (California, Nevada, Arizona and Utah). 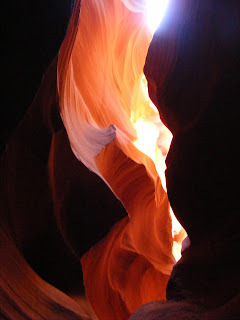 Here are some images that I hope will inspire some landscape art quilt for the next few years! 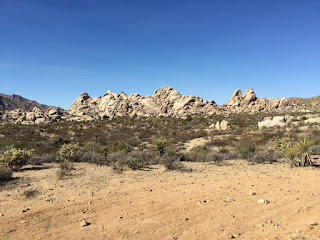 Our first day in the desert - the landscape is amazing. I suspected that I might get tired of rocks, shrubs, sand, and mountains in the distance (repeat!). 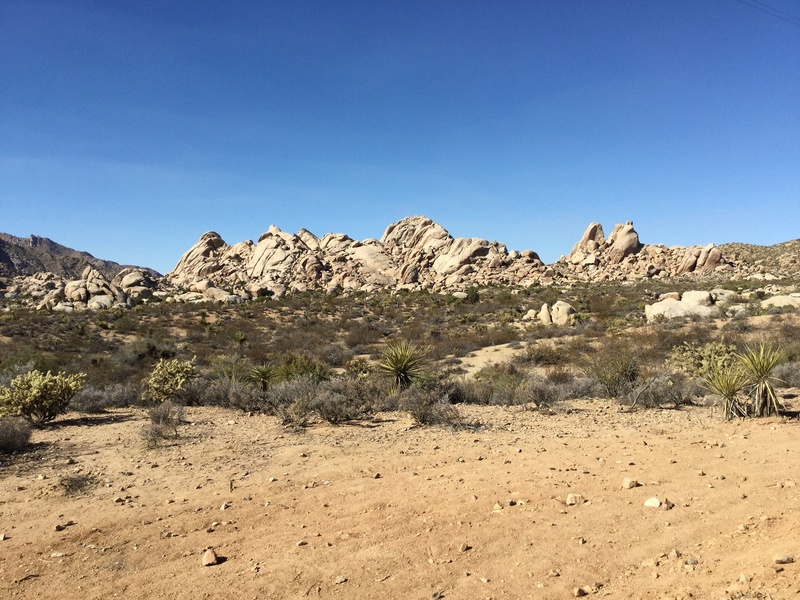 Although the novelty wore off after 6 days, the landscapes are so sparse and different from home that they were still fascinating. It's a land of subtle contrast and beauty. I want to capture the mountains with their coloured striations in fabric. 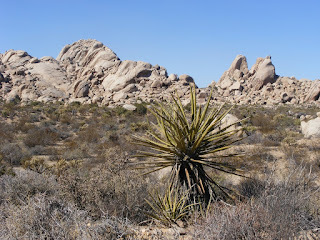 Each place we went, the mountains, rocks and vegetation were all slightly different. The more fertile lands of Zion National Park was incredible because many of the desert features were present next to the water. 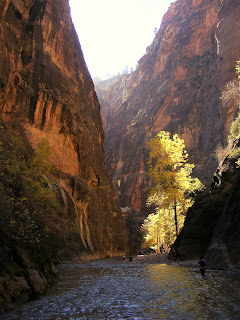 I finally got to hike the Narrows. We hadn't been able to do it the last time we were there, so this was a must do! The water was so cold that I didn't last long. Next time I'll be more prepared. We hadn't seen Horseshoe Bend the last time we were in the area. What an amazing view. I guess I come by it honestly since I was raised in the mine country of Northern Ontario - but I am just blown away by the variety of these rocks. Stunning! 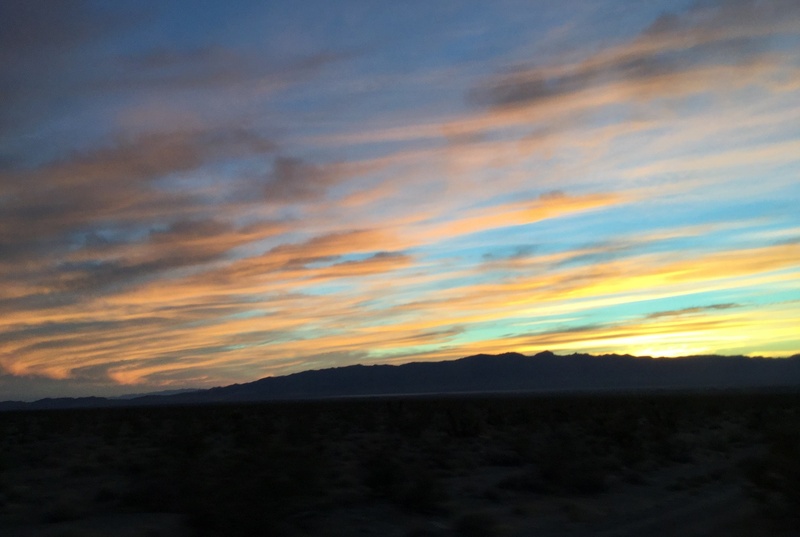 We were lucky on our last road trip to see a lovely sunset. 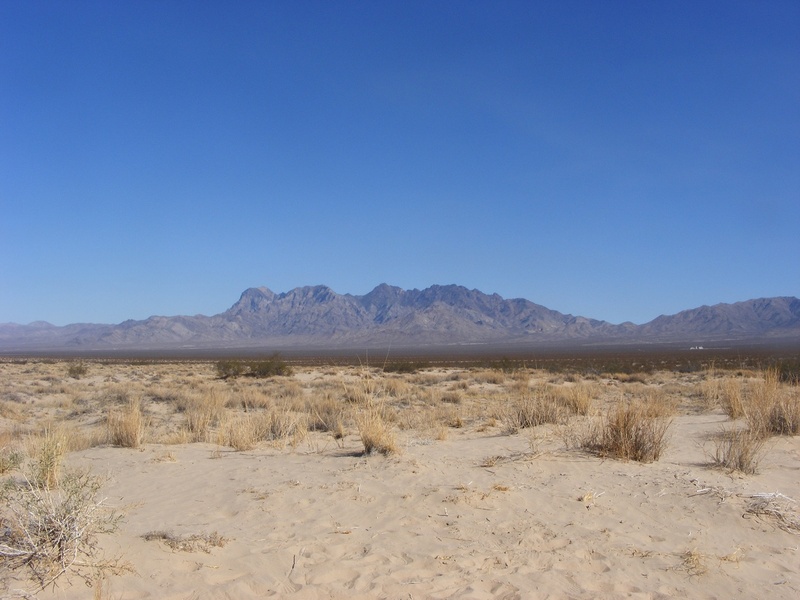 Since there is very little rain, I imagine there are probably few clouds. These were the only ones we say on our trips. It takes clouds to make a beautiful sunset. I guess we have so many here that I never noticed this. I really want to spend some quality time in the American South West when I retire. Wouldn't it be great to be able to see the landscape and then make the quilt right there? Although it gets dark here very early, we couldn't get used to such an early sunset in the South West. 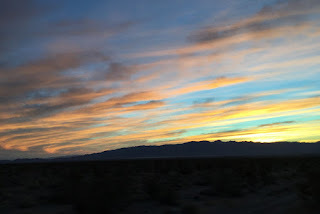 I think it's because it's hot, so it feels like summer - where sunsets are supposed to be late! I'm taking a break from making landscape art quilts but when I'm ready, I'm looking forward to being inspired by one of these! I'm going to show you a sample of my favourites from each category. 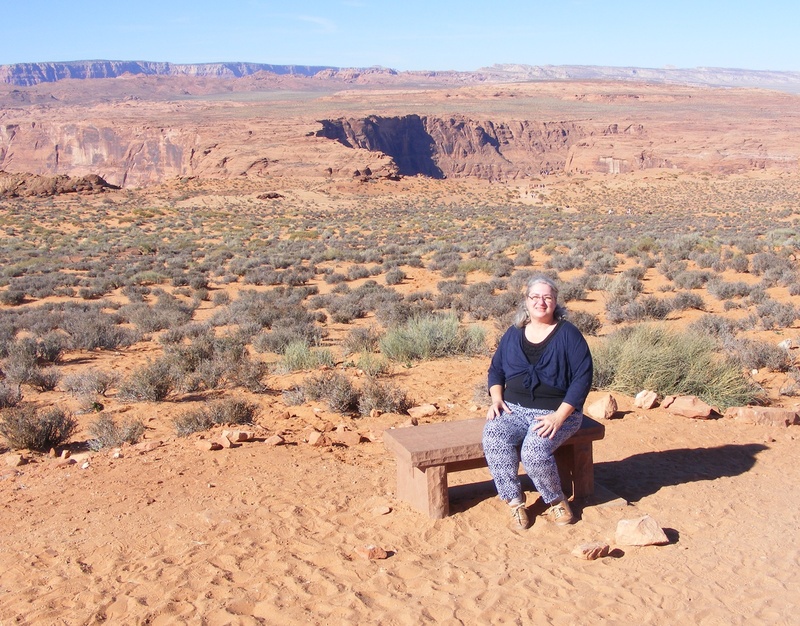 A few of my quilts have traveled far this year. 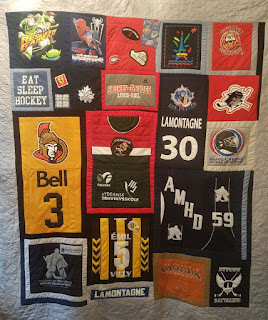 My Bali-Flip lap quilt in neutrals went to Denmark after Christmas and then the Great Hockey Jersey Quilt went away to university with my nephew in the fall. 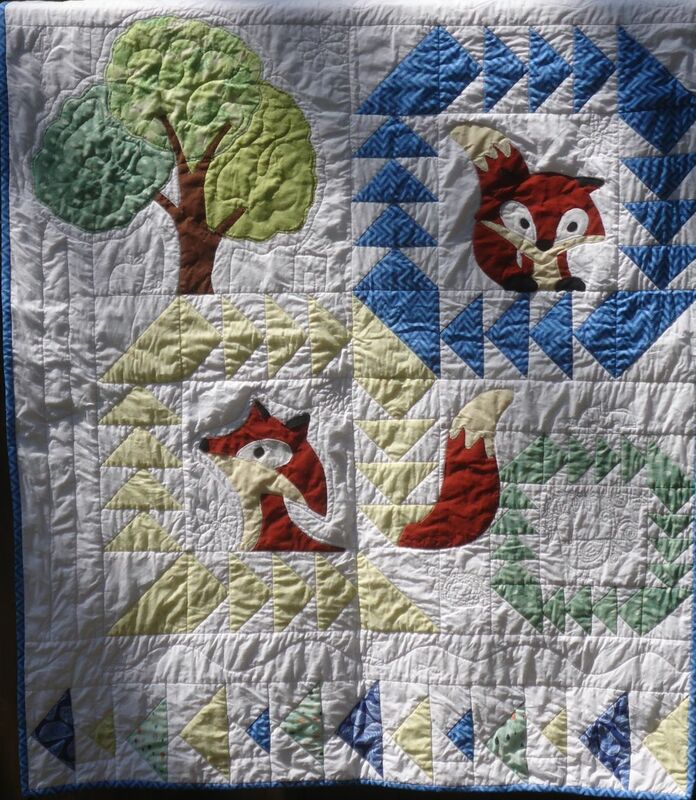 I made two baby quilts this year - the first is an original design, "Beautiful Day" and then the "Fox in a Box", is from a Row House Creations pattern. 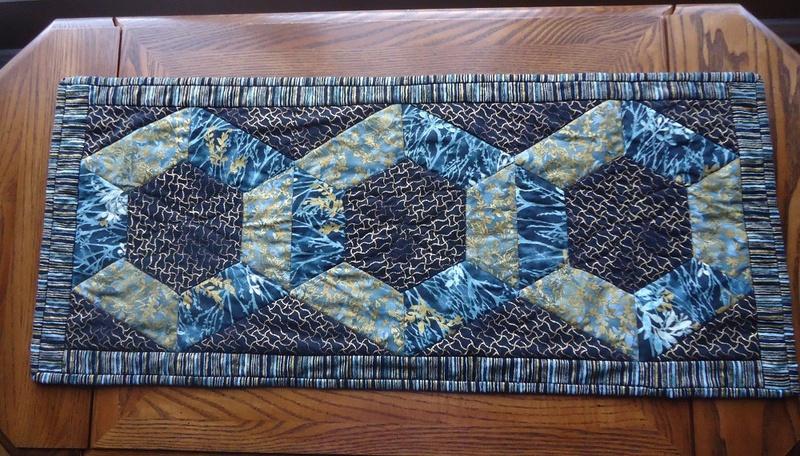 I also made two table runners, one for my pen-pal of over 30 years and the other for my first guild swap to a newer quilting friend. This is by far the category with the most projects this year. 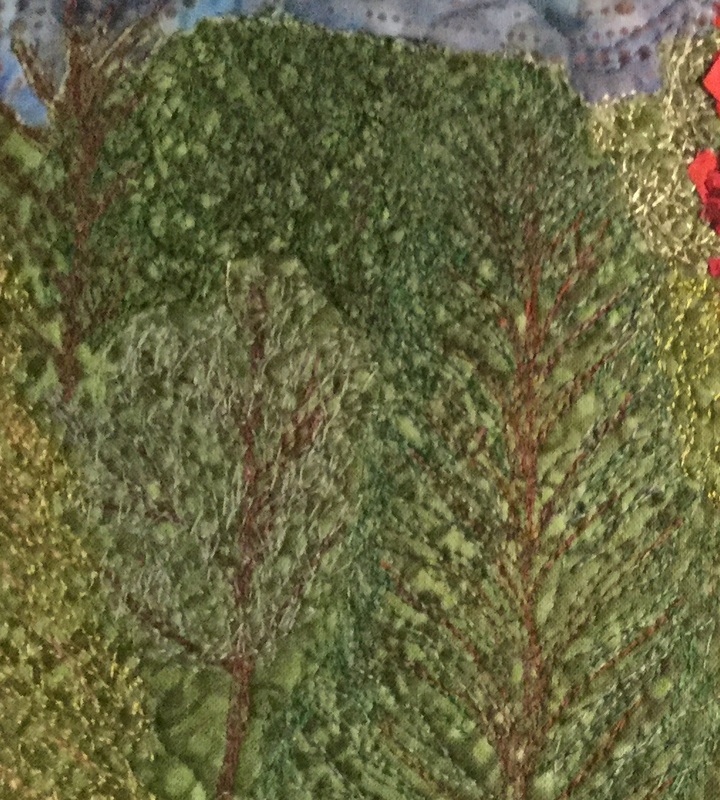 Part of the reason for this is my ongoing personal Landscape Art Quilt Challenge. 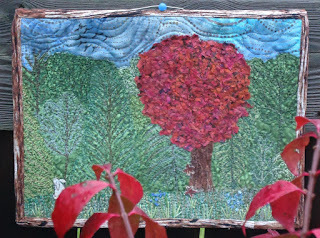 My favourite was made for the Spring Art with Fabric Blog Hop. It's based on a Northern Ontario artist, Sheila Langlois', painting. Although it's not my own design, in my opinion, it's the best work I've done this year. 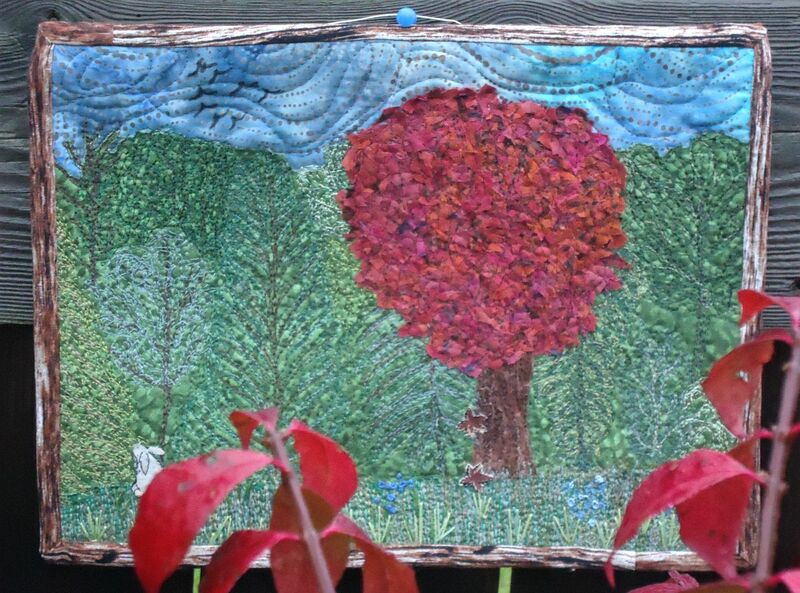 Another favourite is my Woven Landscape. 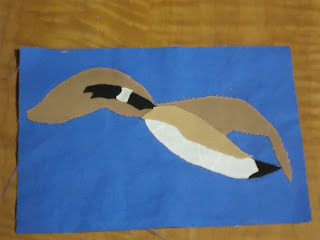 It was interesting to use weaving in a quilted piece. Since weaving was my first love, I want to explore this further eventually. 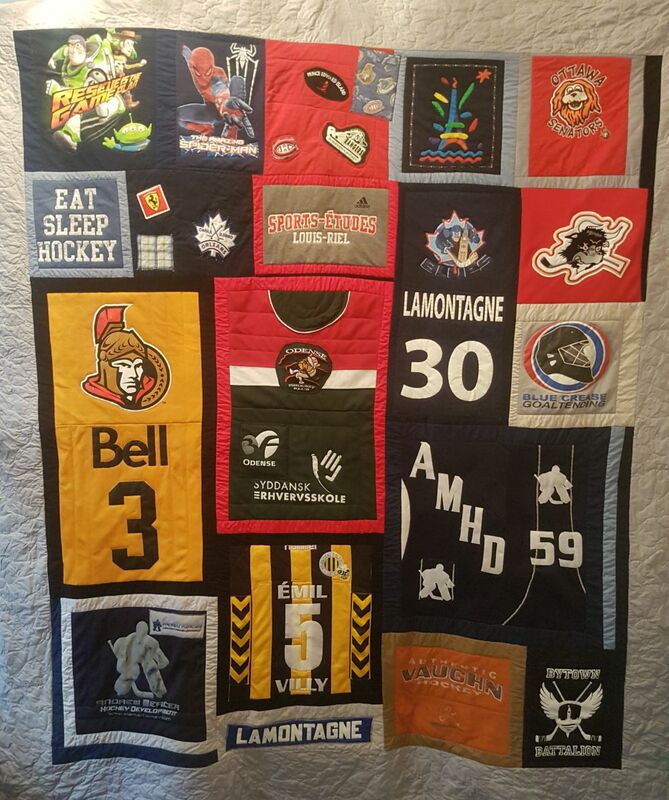 I also want to mention my Hockey Day in Canada quilt since it will be auctioned off in December as part of our Workplace Charity Campaign. At the beginning of the year I participated in a few weeks of the Colour Me Positive Art Journal Challenge. I didn't last very long, but I did learn a few techniques for writing on fabric as well as practicing my FMQ. This piece was done for Week 6 of the Challenge. It was based on His Holiness the Dali Lama's quote, "Be kind wherever possible. 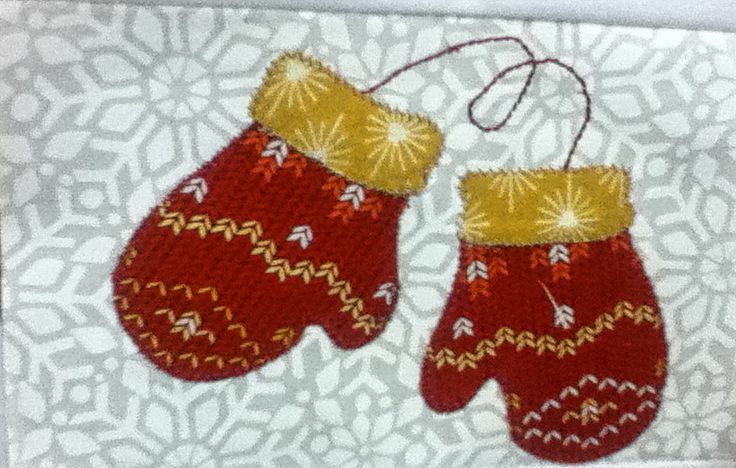 It is always possible.” I used fabric markers as well as FMQ. 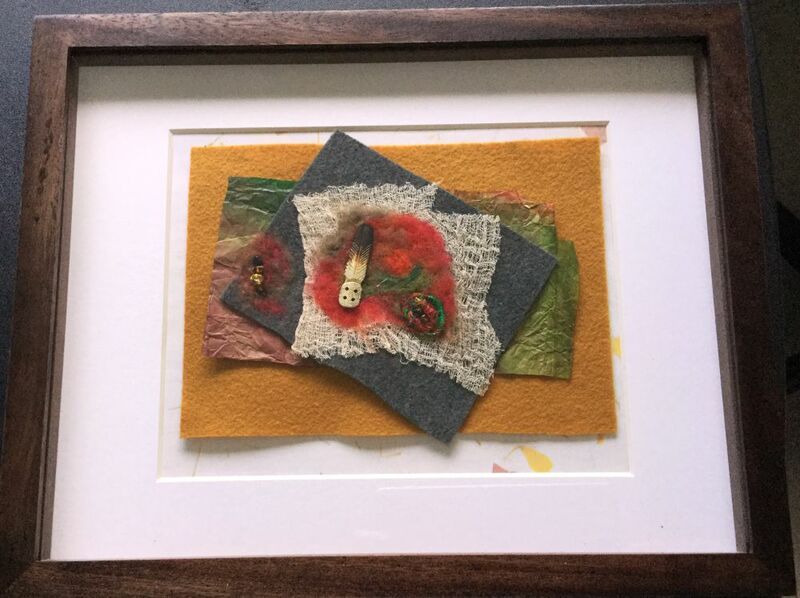 My favourite multi-media art piece was made at a Needle Felting Play Day with the Out of the Box Fibre Artists Group (OOTB). 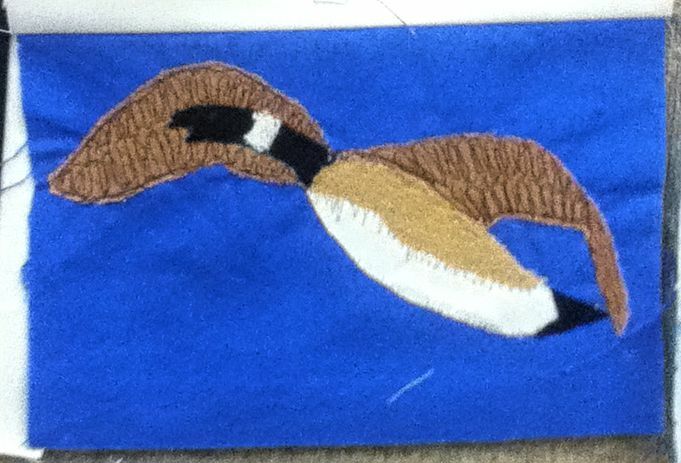 It was a wonderful day and I created "The Feather" using paper, felt, wool roving, cheese cloth, beads and a pin. 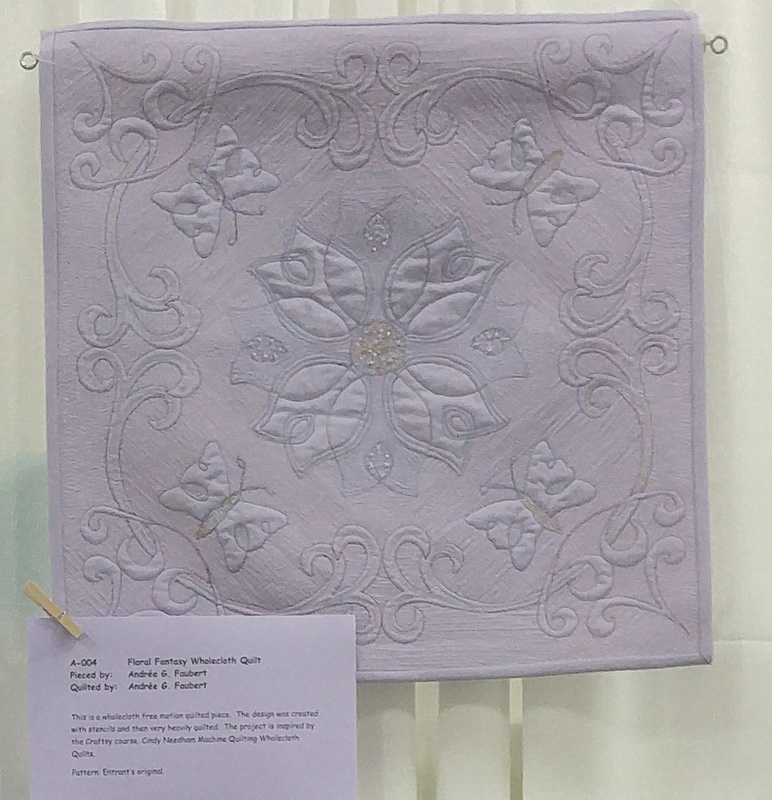 Finally I finished a whole cloth quilt this year and showed it at the CTQG Quilt Show this spring. 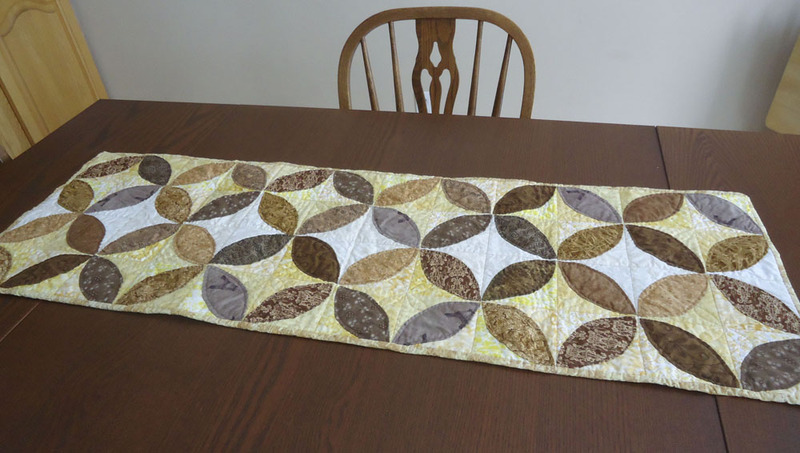 It was a piece based on Cindy Needham’s Machine Quilting Wholecloth Quilts on Craftsy. It was incredibly long to FMQ, but a great practicing opportunity! 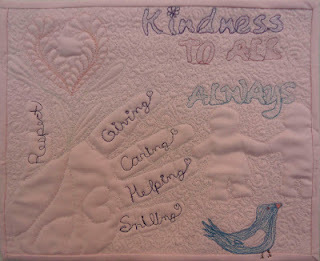 My friends say that I'm a prolific quilter - I guess that I should admit that I am. 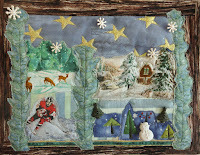 This trunk show, which is only a sampling of my finished quilts this year, is the proof! It would seem that some of my best work have been done because I participated in a specific event, be it a quilt show, an online blog hop or challenge, or a course. I keep saying that I don't like deadlines and pressure, but these often help me produce. 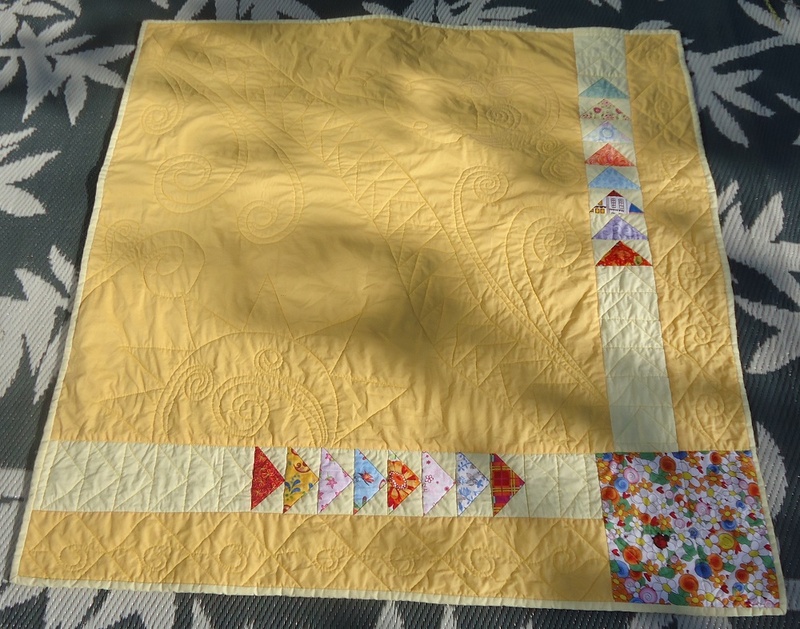 This year, I learned the hard way, the importance of keeping my quilting fun. When I take it too seriously, I tend to over-think, over-do and over-stress. That's not a good place for me. I know that I want to keep learning, but it can't be at any expense. This is a hobby - an important one to me, but not a full-time job. It needs to remain enjoyable. 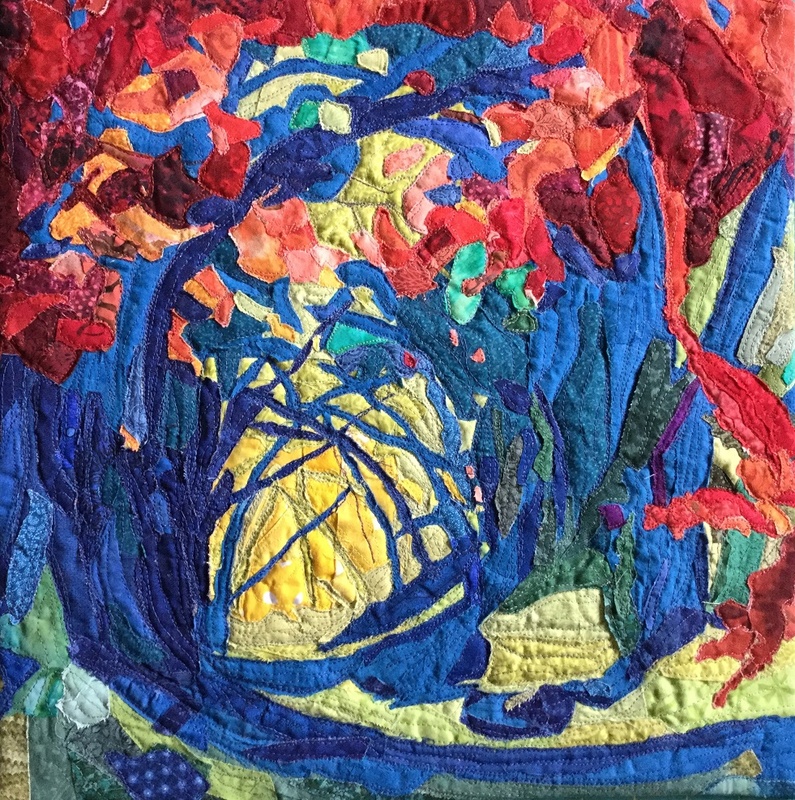 I've learned so much more about myself and my quilting since I've taken the time to reflect on creating art through this blog. Thanks for joining me on my journey. 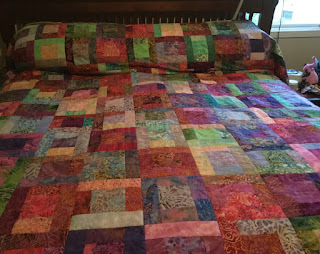 I've linked this post to the Trunk full of Quilts page. 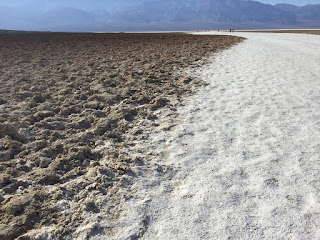 Since I was on holidays last week, I finally had time to read the blog posts. It was a real treat. Check them out! I haven't been able to finish anything recently, but since I'm working on lots of projects and won't get anything done in the next week, I thought I'd post an update. 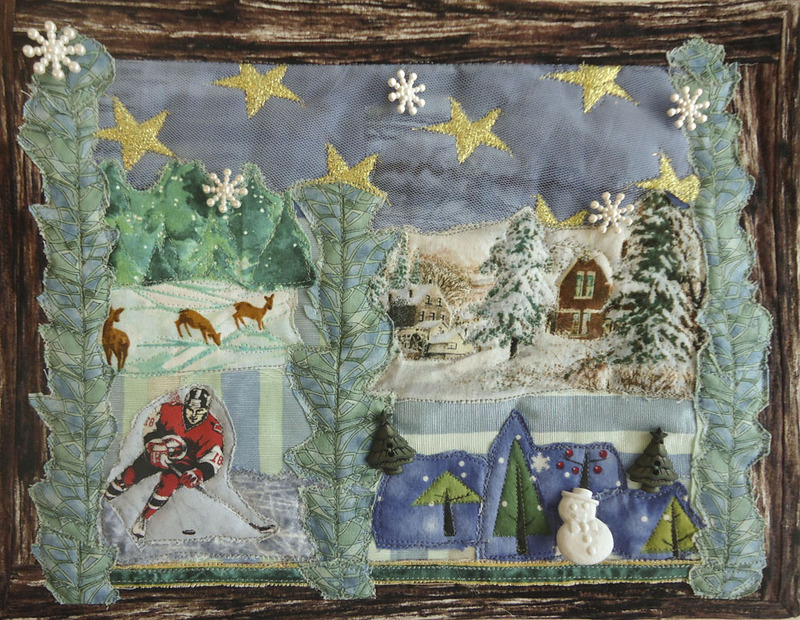 Many quilt guilds are creating quilts to celebrate Canada's upcoming birthday. The Common Thread Quilt Guild asked its members to make blocks representing Canada. The blocks trickled in, but I believe that we finished with over 30 blocks. The blocks are 4" x 6" (finished) and will be made into a quilt that will hopefully be part of a travelling exhibit. I made my block during my quilting retreat this fall. As I pieced this Canada goose together, we got a post on our Guild Facebook page - someone had just finished her Canada goose block! When I got home I thread sketched the block but wasn't going to enter it - but then changed my mind. There are so many Canada geese here that they deserve a couple of blocks! Last night all of the blocks were displayed at the Guild meeting. There were some really lovely blocks, in all kinds of different techniques, colours and styles. It's going to make a great quilt. Here are a couple of pictures - unfortunately I didn't have my good camera so most didn't come out. with JoJo Hall. I'm a little behind but this is the beginning of my second destination project - this one is from Hawaii. I got to learn about Hawaii and received a pattern from JoJo to make a Plumeria Headwrap. The flower is a plumeria, used to make a lei. Here is JoJo's finished project. Isn't that flower amazing? Here is my first flower. 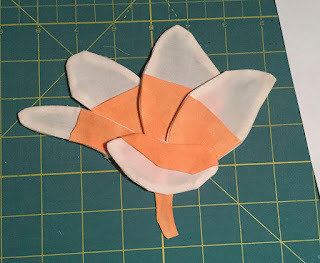 I cut and sewed the pieces but I still have to paint and then stitch the petals to my piece. 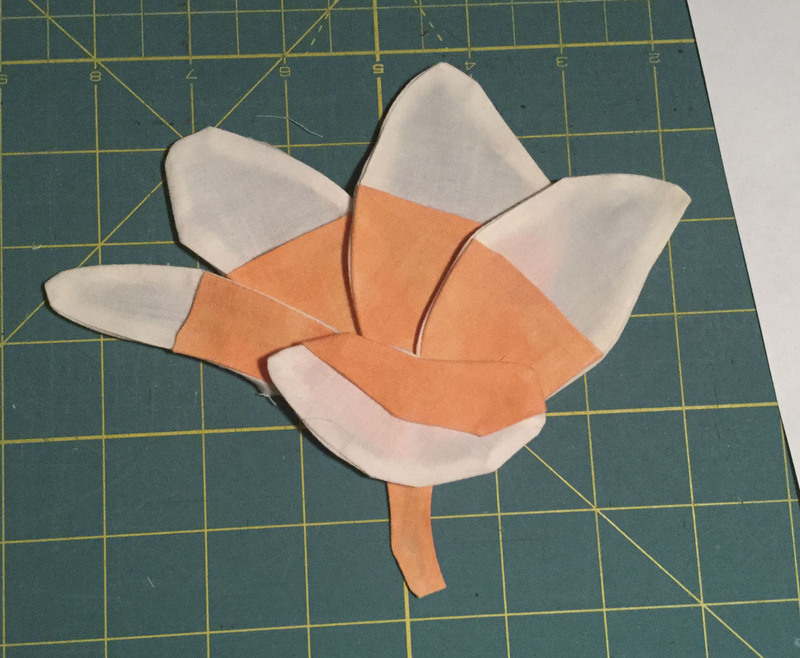 This plumeria will be incorporated into a mostly peach coloured project while the other flower will be in pinks. I don't expect to have this done until possibly the end of November, but I'm not promising anything because I am really trying to stay away from deadlines. 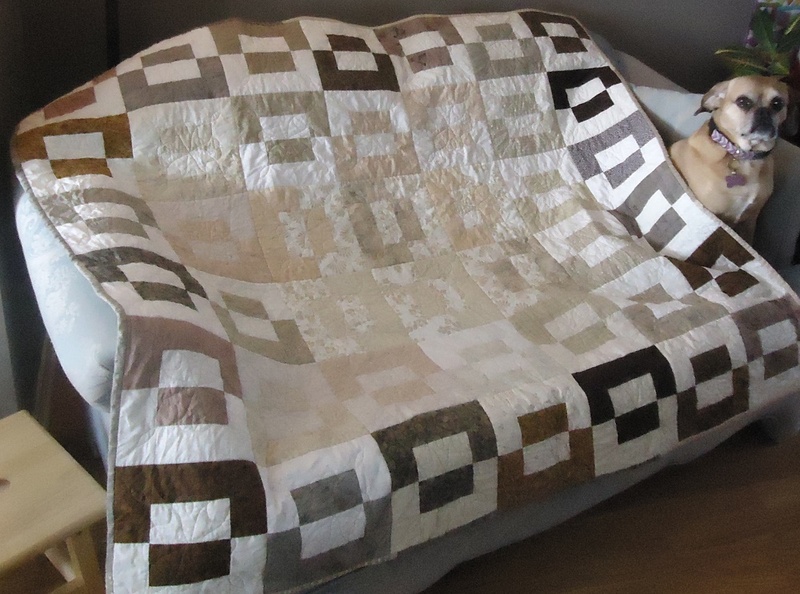 Finally I have put a binding on my bed quilt - it's a king size so it wasn't a quick job. When we come back from the South-West, we'll be warm and cozy. I still have 146 blocks left to quilt (out of the 169) but I figure I will just have to take the quilt off the bed and keep at it. Since I've quilted around each block, the quilt is solid enough to use. Well, I haven't finished packing and we leave tomorrow morning, so I will be back in a week or so. 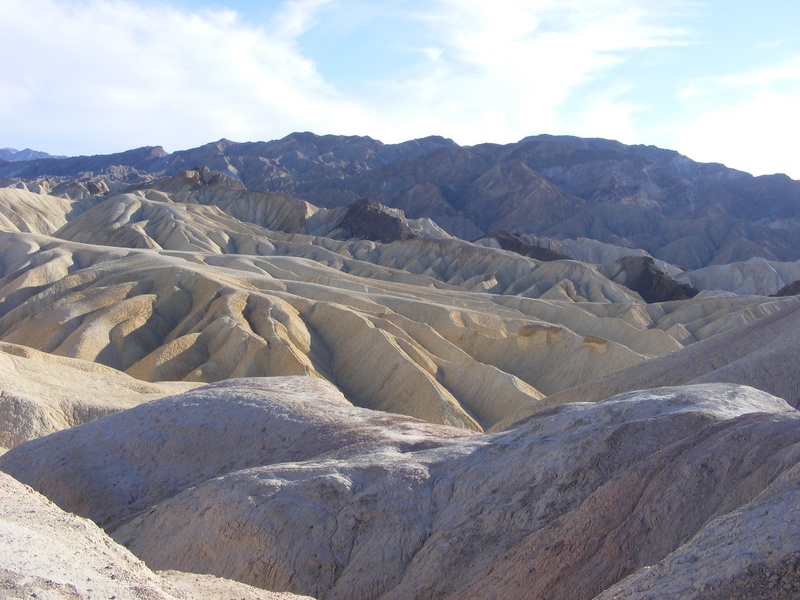 Heading to the deserts of the South-West US. Writing a post is more fun that packing - that's why I'm procrastinating! It's great to be able to advance projects - every little bit helps. If it's not fun, what's the point? I have to remember this one! I'll be linking up to a few linky parties. Check out what everyone is making! Linky Tuesday, Let's Bee Social, Midweek Makers, Fabric Tuesday, Oh Scrap! I read an interesting article in the latest Quilting Art magazine (Oct-Nov 2016) about value. 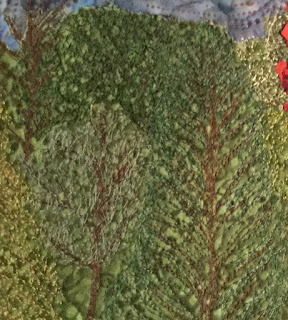 Call it serendipity - it came as I was wondering what was wrong with my latest landscape art quilt. 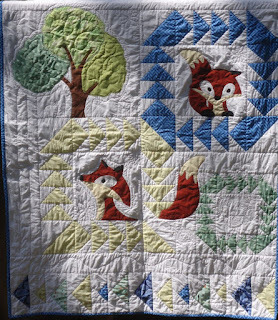 Why was my quilt not as amazing as the vision in my mind? 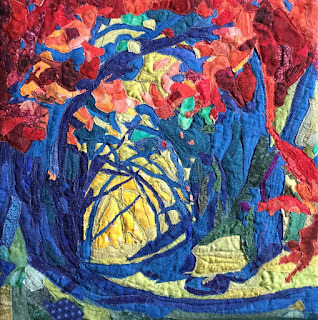 I usually create landscape art quilts from photographs, but I knew what I wanted, so I tried creating it using only my memory and imagination. Darn it - it seems that I had a new lesson to learn! Since I've also been reading about the usefulness of working in a series, I thought that this project would be Lone Tree 2. On the drive home from work in early fall, I saw a very red maple tree in a small clearing. It caught my attention because although it was very red, all of the trees behind it in the forest were green. None of them had started changing yet. I took out my sketch book, drew a very quick picture and wrote "I'm tired and I want to rest - or Overachiever?" Was that tree looking to go to sleep early or was it an overachiever, trying to beat everyone to the fall pageant? 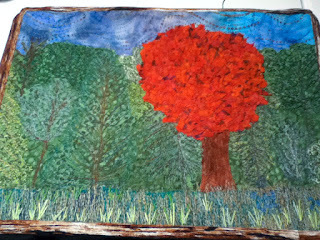 At home, I found fabric for a green background, the sky, the foreground and the red for the tree. 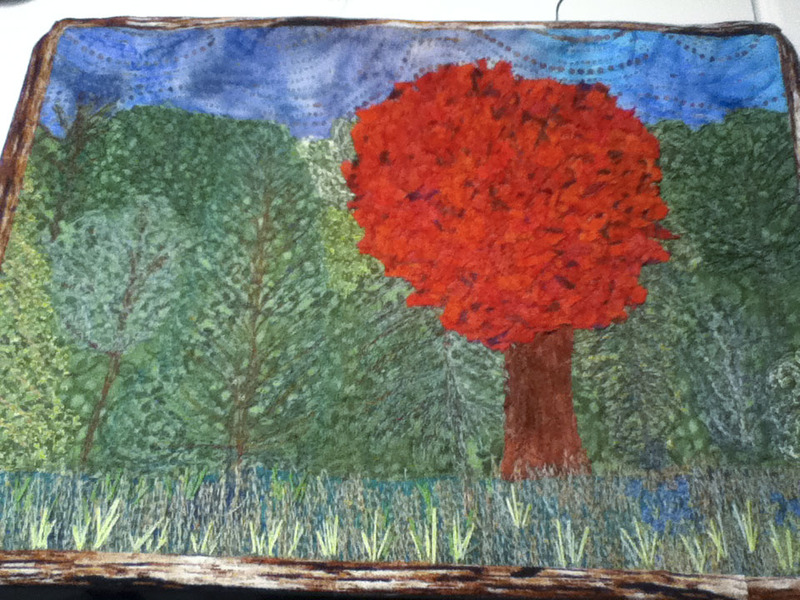 The background with the lone red tree would take up at least half of the piece. I thought the red tree would stand out against a dark green background. 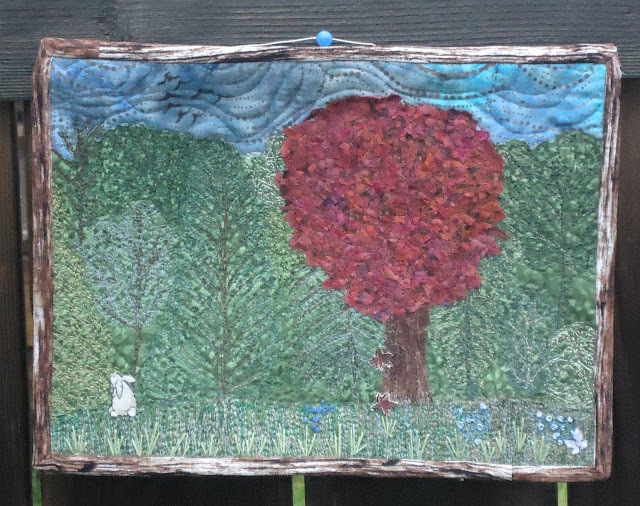 I was also going to thread paint the trees making up the background. 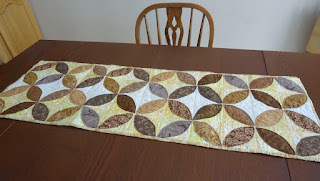 I took out all of my green thread (polyester, cotton and silk), and started free motion quilting (FMQ). 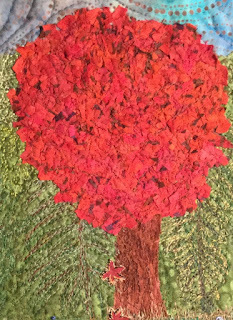 I wasn't thrilled with the background but couldn't wait any longer - I had to create the red tree. I cut the batik fabric I had chosen into very small snippets. I placed them where I wanted the tree foliage and proceeded to FMQ over them. I was surprised by how much fabric it used up! I then created the tree trunk. Adding limbs to the trees helped! As I examined the green background I wasn't sure what was wrong. On my way to work the next day, I looked at the forest and noticed that no matter how thick the foliage, there was always tree trunks and branches showing. So I took out my brown, black and grey thread and added some limbs. It really helped! Lone Tree 2 - what now? OK - now I had a sky, a red tree with a background and foreground that all seemed to blend in. Now what? I took out my embroidery floss. 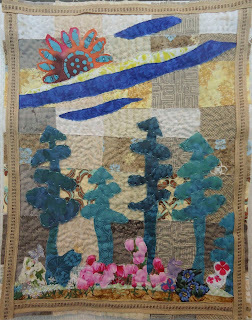 I had FMQ some blue flowers in the foreground, so I added some lighter green grass and more blue. I looked in my bags of scraps and found a bunny, a butterfly and leaves. Getting much better. The white bunny added contrast. Now the viewer sees the tree, wonders off to the bunny, catches a glimpse of flowers and the butterfly and can keep exploring. Lone Tree 2: I'm tired and I want to rest - or Overachiever? I thought that the dark green background would be fine because green and red are complimentary and contrasting colours. It would seem that I forgot about the value of colours. In her article, The Value of Value (Quilting Arts Magazine Oct./Nov. 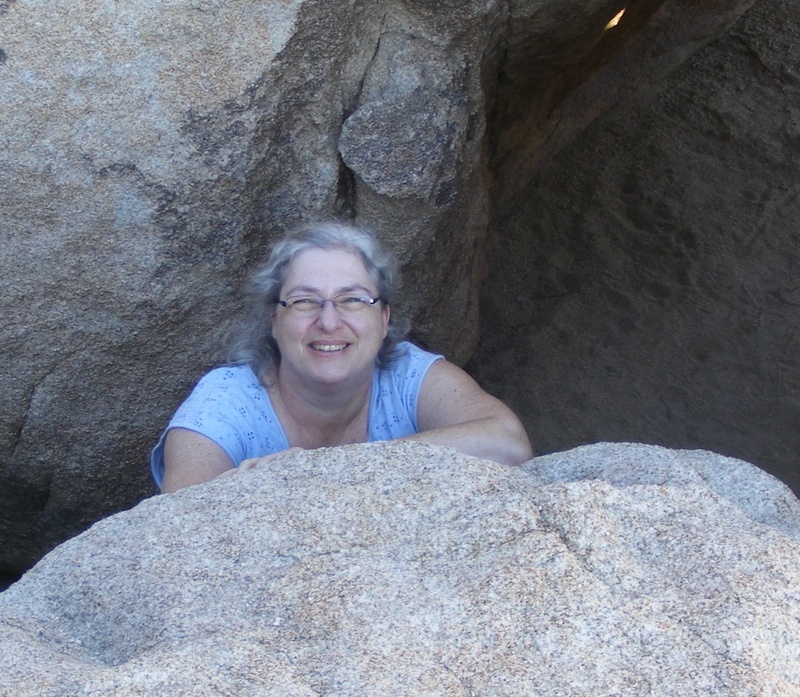 2016), Grace J. Errea writes "if there is a problem, look for a value solution first." She suggests that a successful design should have tints (lighter versions of colours), shades (darker versions of colours) and intermediary values. The article is very informative and easy to understand. She also uses a Value in Colour Chart that I will make from scraps to remember my value lesson. Lone Tree 2 behind the burning bush. Although it was a little late to change the values in my landscape art quilt, adding the appliqued elements, the lighter green embroidered grasses and blue flowers gave my piece some tints to contrast the mostly darker tones and added some visual interest. Using a photo probably helps to avoid some of these errors because I would be more likely to notice the lack of value in a photo and adjust accordingly. This post is linked to some great linky parties. Check them out! MOP Monday, Oh Scrap!, Off the Wall Friday, Can I get a Whoop Whoop?, Slow Sunday Stitching, Finished or Not Friday, Monday Making, Main Crush Monday, Linky Tuesday, Fabric Tuesday, Let's Bee Social, Midweek Makers.